All Dragons are warmly invited to sail in what is probably the best Dragon winter sailing. Cascais has proven over the years to have some of the best conditions for sail racing in Europe. 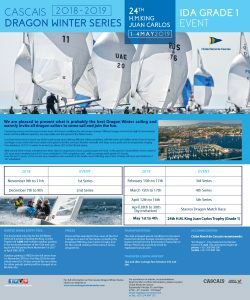 Different ranges of wind, from light to low twenties knots and from different quarters, are expectable over the period of the Winter Series. Less than half an hour to reach any of the usual racing areas offering different sailing conditions, with flat water and shiftier winds closer to the bay and larger ocean swells with more stable wind patterns further out west. Weather normally with large sunny spells and air temperature ranging from minimum 12/15 degrees in winter to as much as above 20 degrees in the fall and spring. There will be Dragons for charter as well as boat transportation and special rates for accommodation. Prizes will be awarded to the crews of the first three Dragons in each of the Series, including the Perpetual HM King Juan Carlos I Trophy and for the overall ranking of the entire six series programme. The discounted entry fee for the full Winter Series of six events including the King J. Carols Trophy is 1000 Euros and includes outdoor parking in the enclosed premises of the Club and craning for the full period from November to April 2019. Outdoor parking is FREE for the full series from November to May 2019; for individual events for 30 days around the race dates. For other periods parking will be charged at an 8 Euro daily rate. November, December 2018 and February, March, April and 1 – 4 May 24th H.M. King Juan Carlos Trophy (Grade 1). Please view the event brochure for full dates and details. They are looking forward to welcoming you to join them in some good dragon sailing and enjoy the usual Cascais hospitality.